TruHart USA specializes in manufacturing high performance suspension and tuning solutions to meet the needs of today's most demanding enthusiasts. Through extensive R&D and testing, we deliver products that continue to outperform the competition season after season. Our products are designed with longevity in mind, which is why we only use the highest quality raw materials and heavy duty Hard Race bushings and ball joints. All of our products are backed with an industry leading 2 Year Warranty*, giving you the performance you want with the peace of mind you deserve. In 2009, we partnered with Urban Import, an industry leader with over a decade experience, to help expand our distribution channels across North America. Our partnership has allowed us to increase production capacity and decrease shipping times, resulting in a better experience for both our dealers and end customers. TuHart products are covered by a limited manufacturer’s warranty against defects on originally installed vehicle for the period stated below. Warranty does not cover parts that have been abused, modified, incorrectly installed or used for other than the original intent or application. Normal wear and tear (at the opinion of Truhart) is not covered under warranty. Proof of purchase is required for all warranty claims, warranty applies to original purchaser only and is non-transferable. Shipping and labor are not covered under warranty. 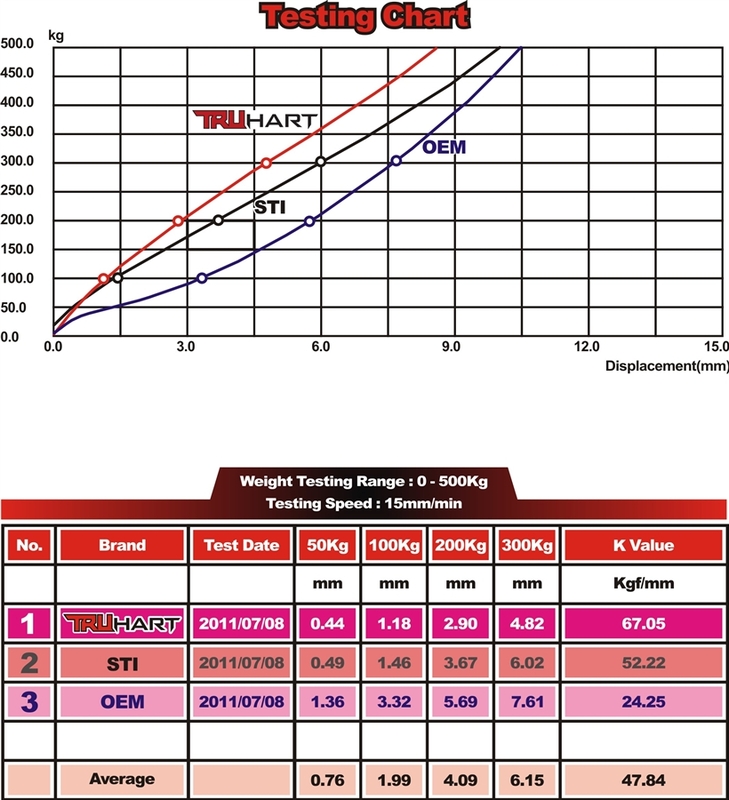 The below chart shows bushing stiffness for the proprietary blend materiel used in Truhart products vs OEM STi bushings vs standard OEM bushings.